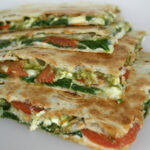 Quick and simple vegan quesadillas with spinach, tomato, and pesto! An easy, flavor-packed meal! Add a light layer of mozzarella cheese, then feta, if using. Add tomato slices, spinach, and top with another layer of mozzarella cheese. Place the other tortilla on top, heat for about 5 minutes, flip, and heat for another 5 minutes or until cheese has melted. *For easier flipping, use only one tortilla per quesadilla: fill half of the inside with the toppings, then fold the top half over. Repeat the same for the other tortilla.